North of San Francisco, across the mythic Golden Gate, lay the rolling hills of Marin and Sonoma counties, gold in summer, verdant in winter. For many of the Haight's denizens, suffering burnout, ennui or police heat, the siren call of the North drew their embattled souls to the land of the red-tailed hawk and live oak shrub. Morningstar was the first refuge with an open land policy. Founded by Lou Gottlieb, a former member of the folk-singing trio Limeliters, Morningstar was known as the "digger farm" in the Haight, supplying apples and other organic fruits and vegetables to the Free Food programs. We have a growing collection of materials here, due to the diligence and labors of love of many graduates of these Free Land communes. Ramon Sender Baryon's meticulous undertaking to document the history of the Free Land movement through reminiscences and painstakingly edited oral history interviews. Pam Hanna's vivid personal recounting of both the California and New Mexico branches of Morningstar. 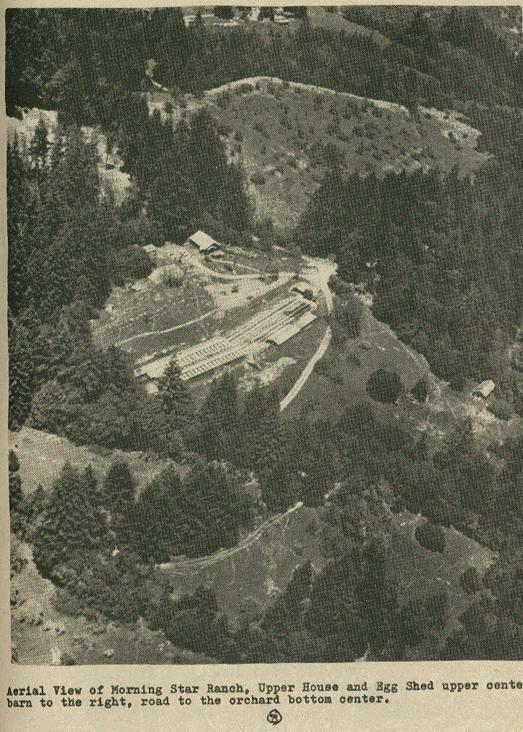 Aerial view of Morning Star Ranch. In the upper center of the photo are the Upper House and Egg Shed.